Victoria Azarenka suffered another quick ending at the Mallorca Open Thursday evening. The skills of Lucie Safarova were too much for the former number one as the Czech showed great control on the first serve to win in straight sets 6-3, 6-4 on Pista Central at the Santa Ponza Country Club. The two haven’t faced off in three years making it a very interesting match with the current status of both players. 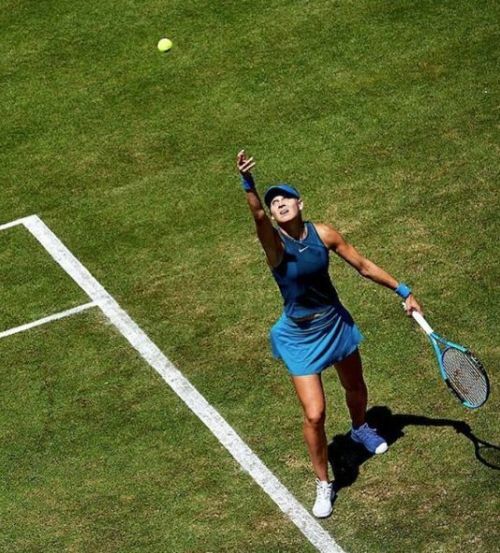 While the Czech hasn’t shown consistency since the Australian Open, her time on the tour played to an advantage over Azarenka who had to deal with legal issues of a personal nature. In Wednesday’s match against Stefanie Voegele, the Belorussian needed three sets to recover from the lost time. While the first-round jitters were out of the way, facing Safarova wouldn’t be like before facing her opponent on grass. The key would be who got out of the gate and found comfort in their game to build up a stance that could move them into the quarterfinals. Both went along with the hold of serves spanning four games before Azarenka recorded the first break of the set. She tried to consolidate cleanly on serve but got into a deuce draw with Safarova who took it after two breaks. They leveled at three all getting back on serve wherein the seventh, Safarova took control and never let go. She consolidated the 4-3 lead on serve breaking Azarenka before serving out the match that gave her a comfortable lead in the match after 41 minutes. Despite having committed three double faults, the seventh seed carried a stronger first serve that was the difference maker with 17 winners. It was the only factor she bested Azarenka in as they both suffered on the second serve and returns. A need for improvement by the Belorussian started withholding her serve but she was quickly broken in the third. In response to stay level in the set, she delivered her first triple break of Safarova gaining back the ability to dictate on both sides of the ball. Azarenka got back out front after a hold in the fifth where she showed better groundstrokes on the forehand. Safarova wasn’t going to let the improvements of her opponent trouble her as she easily matched the score on the serve. They were deadlocked at eight with the former number one on the ball under pressure to hold in the ninth. Down two breaks, the Czech had her beat with a line drive winner to take a 5-4 lead serving for the match. She put together a great win in the tenth holding firm against Azarenka to end the day for herself in 1 hour and 20 minutes. It was just the second time this season she won back to back matches.
.@luciesafarova books the last spot of the @MallorcaOpen quarterfinals! An improvement of the second serve from Safarova helped pick up what struggled in the opening set with a lively return game that assisted in her holding off Azarenka. She averaged 73 percent from the first serve that was enough to get the result needed. With success building for the seventh seed getting into the quarterfinals, the 31-year-old would face Tatjana Maria of Germany on Friday.